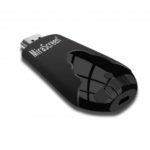 Simply connect this 5G Miracast HDMI TV Dongle Adapter to your HDTV, and you can wirelessly display contents from a compatible smartphone or laptop. Anything you can see on your laptop or tablet, you can see on your HDTV. Enjoy videos, photos and movies on the best display. 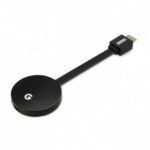 Wireless Display Adaptor streams online video, music, images etc. Play tablet or mobile games on your TV, enjoy somatosensory games with big screen. 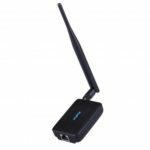 5G WiFi Module, fast fluent and perfect image with HD 1080P, offering you a perfect home theater experience and sharing the wonderful movies with your whole family on the best display. 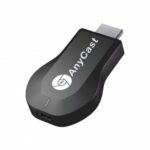 Supports Miracast, Chromecast, DNLA, Airplay, Airmirror widi, it can cast your smartphone or laptop to TV or projector via WiFi. Just plug and play, needs no any other drivers. 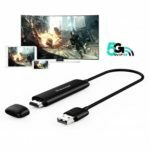 Perfectly suitable for teaching, business presentation, meeting, or daily use, such as watching movies, playing games, etc. With 2.4G + 5G dual-band technology, you can enjoy faster file transferring and smooth games. 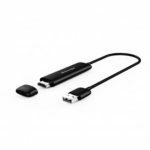 Compatible with phone, tablet, notebook, etc. Japan imported antenna, stable and higher speed.